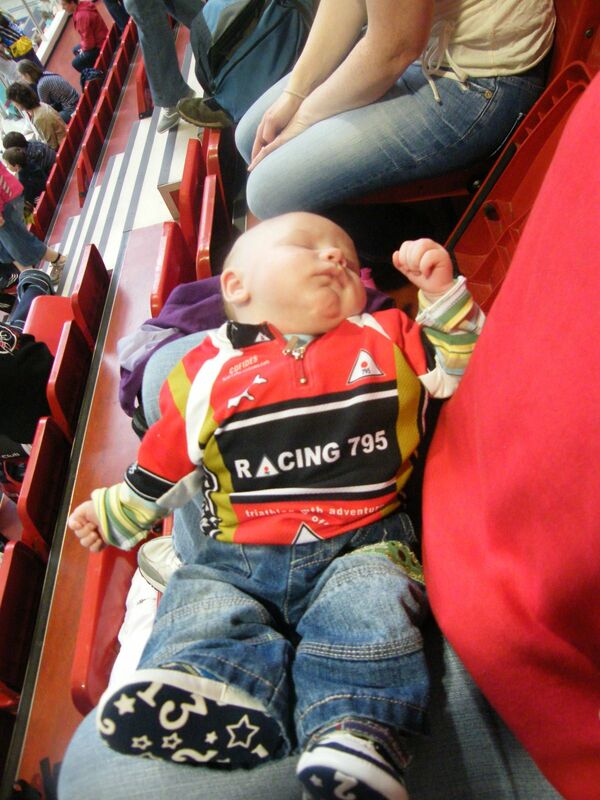 The newest member of the 795 family, Cian gets some kip. For five Racing795ers and their support crew all roads led to Limerick last weekend. Barry took part in the olympic and Joy, Siobhan, Ruairi and PJ in the sprint distance. The sprint distance started first with all bar Siobhan off in the so called “fast wave”. The 50 m pool was a bit daunting at first but all the 795ers quickly got in to their rhythm. Siobhan had the last laugh. Having started in the second wave, she put in the quickest swim time, 11m 20 sec. In the olympic swim Barry just made his wave start in the nick of time (Too busy supporting his clubmates). But it didn’t upset his swim putting in a very strong swim with a time of 28m 47 sec. Out on the bike and the triathletics were all fighting a strong wind coupled with a not so smooth road surface. It was an out and back course, the sprinter doing 23.5km and the sole olympian doing 40 km. Good times were put in by all. Meanwhile back in transition the crown of transition king was taken up by Ruairi with two very impressive transition times. On with the runners for a 5 km run for sprinters and a two lap 10 km for Barry. Ruairi and PJ posted great times with only 6 seconds between there run times. But the most impressive run of the day was put in by Joy with a PB of 25min 42sec. Another great day on the triathlon Ireland calendar. Thanks to the support crew of David F, Claire, Lorraine, Martin, Yvonne and all the kids.